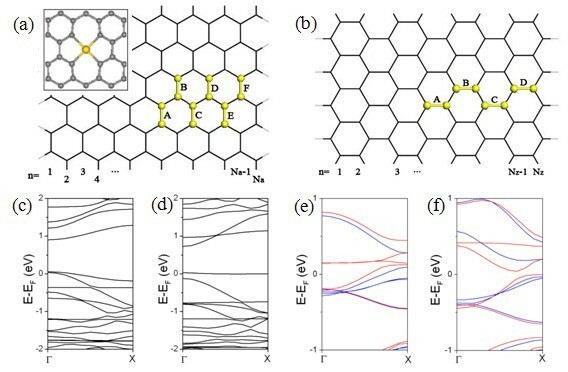 We present the electronic properties of gold doped graphene nanoribbons using first-principles calculations based on DMol3 package. Electronic band structures of Au-doped 14-aGNRs and effects of Au atoms doped in zGNRs on the electronic band structures were also investigated. Fig.1. Schematics of inequivalent substitutional sites on (a) 14-aGNRs and (b) 8-zGNRs. Carbon atoms at the edge are passivated by hydrogen atoms indicated in gray. The band structures of Au-doped 14-aGNRs at site (A) and site (F) are shown in (c) and (d). For 8-zGNRs, the band structures of Au doped at site (A) and site (D) are shown in (e) and (f), α- and β- spins are represented by blue and red lines, respectively. Fig.2. Variation of band gaps of Au-doped aGNRs (a) and zGNRs (b) as a function of width. Blue square and red circle in (b) represent α-spin and β-spin, respectively.